Penshurst, a rural town, is 28 km south-east of Hamilton in western Victoria. It is situated about 2 km north of Mount Rouse (367m) which was named from a distance by the New South Wales Surveyor-General, Thomas Mitchell, when returning from his Australia Felix expedition in 1836. 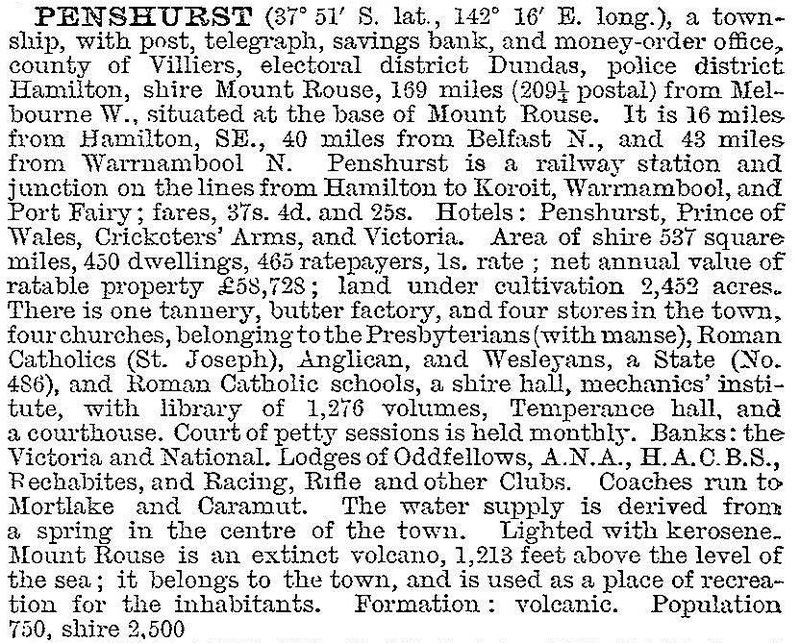 Pastoral settlement in the Penshurst area was the Mount Rouse pastoral run (1839), which ended in 1840 when the land was resumed for the Mount Rouse Aboriginal Protectorate. The protectorate ended within about six years and the land reverted to pastoralism. In 1851 a place on the road to Hamilton (now the Hamilton Highway) was chosen near the former Aboriginal reserve for a village. Its name was probably inspired by Penshurst in Kent, England. The Mount Rouse Road District was established in 1860 and Penshurst was made the administrative centre of the Mount Rouse shire in 1864. During the first decade of the 1900s there was considerable closer-settlement farm activity around Penshurst. Aspects of Penshurst are described in Good bye girlie, Patsy Adam-Smith’s autobiography which begins with her life in Penshurst before World War II. A bush-nursing hospital was opened in 1925, and after World War II it was rebuilt as a larger memorial hospital. The postwar boom years also enabled the construction of a swimming pool (1960) in place of an earlier baths (1920). During 1940-51, as a result of war-time requirements, one of the Western District’s flax mills operated at Penshurst. In 1966 the butter factory was taken over by Murray Goulburn and closed soon afterwards. Penshurst has several shops, a hotel, a racecourse, a large memorial hall, a sports reserve, a public garden with the Penshurst spring, a bowling green and swimming pool, Anglican, Catholic and Uniting churches. There are also a health service (former hospital), a Catholic school and a State primary school (13 pupils, 2014). Mount Rouse is a public reserve with a lookout, and a volcanoes discovery centre has been opened in the heritage listed former Mount Rouse shire offices. The town’s main industries are a steel fabrication factory and a quarry on Mount Rouse.